Helping Mitch is an experimental short story and comic. Mitch, who just turned 40, used to run a successful manufacturing business. At the height of a typically stressful week, he was struck by a delivery truck and was never the same again after sustaining brain damage. The story explores the relationship between Mitch and his mother, Sharon, who has taken it upon herself to bring the old Mitch back at any cost. I think this has been the longest I have gone without posting so far and for that I feel terrible. I’ve been mentally beating myself up for falling behind, not getting it together in time and not keeping my word of keeping a consistent posting schedule. The delay of the last two weeks has been largely due to rewriting Helping Mitch, dealing with personal issues as well as what I am starting to notice as a pattern of “burnout” at the end of each month. During these burnout periods, I feel rather hopeless and unable to do much else except watch Buffy the Vampire Slayer (the TV series on DVD) from my bed (and eat cookies). What I’ve come to realize is this: although I loooove working on comics I need to pay attention to other areas of my life and start integrating little things that recharge me on a more regularly basis. As the weather gets warmer, I’m looking forward to running outdoors on the trail and going for walks with my friends while having long, meaningful conversations about life. For now, I’ll stop beating myself up because the important thing is to just keep at it despite getting off track. Thumbnails (aka my embarrassingly bad scribbles) – the goal here is not to make pretty drawings but to layout ideas as quickly as possible. I usually generate many, many versions of how I want the page to look before picking one. Sketch – give form to the scribbles. This is done in a sketchbook with toned paper. At this stage general values are blocked out and because I want a bit of grit for the story, quick textures are applied sometimes using a toothbrush. For some reason I mapped out the speech bubbles at this stage, rather than in the thumbnail, and then covered it up with paint. I have no idea why I did this to be honest. 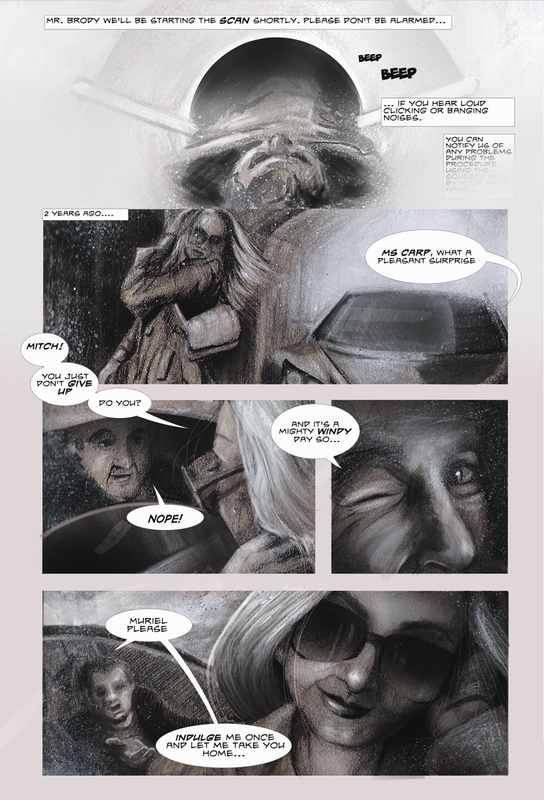 Draft – sketch is taken into Photoshop for clean up and ComicLife to add the speech bubbles. When I looked at the final composition I was unhappy because the page was rather static. I did not like what was going in the last three panels. Final – The final compositional decisions were made to fit what was happening in the story. Mitch is going for an MRI check up and this is a good opportunity to bring in some flashbacks to explore Mitch’s character prior to the accident. It made sense to expand the top panel and blend it into the background to visually separate it from the flashback panels as well as imply that the following scenes are his memories. It seems like such an obvious solution now but I struggled for days trying to figure out what wasn’t working. I even tried making fuzzy memory borders around the flashback panels but it made the page look rather cheesy. Gah! I just noticed, as I type this, that I missed the opportunity to put Muriel’s reflection on the car window and the reflection in her sunglasses to describe more of the surroundings. Definitely something I will come back to and update! I truly hope you enjoyed reading the fourth page of Helping Mitch and the process behind it. If you have any questions, suggestions and/or comments, please feel free to connect with me through email or in the comments section below. This is my favorite page of this story so far, you’re in the groove. I love the layout, the position of the word bubbles, and the style of each panel. I’m glad to see you’re working well with comics. I’m also glad to see you explain the process, that is important. Your thumbnails are better than my drawing skills will ever be. Thank you, my friend, for taking the time to read the page and the process! I greatly appreciate your words of encouragement throughout this adventure into making comics (which is surely riddled with self-doubt). I’m really glad this is your favourite page so far as I felt there was a ton of learning and growth that happened between the 3rd and 4th page. I also wasn’t sure anyone would be interested in seeing the process but it’s helped enormously in figuring out which aspects of the process can be improved. Thanks so much again for stopping by and reading! I can really get behind the growing pains and self doubt. Thanks for sharing. Your doing good. Keep at it. I especially appreciate the mri words that blur into whitness. A nice touch. Thanks so much for reading! It really makes my day when someone notices the little details like the fading text. There’s a lot of invisible or passive work (ie. looking, planning and head scratching) that goes into trying to achieving a certain feel in each panel and page. Fantastic work! It’s been a dream of mine to start a graphic novel and this is very inspiring! Keep up the marvelous work and I look forward to more! Thanks so much for dropping by, reading the page and for your encouragement! I’m really interested to hear more about the process of your illustrations, this is a whole new world to me, so thanks. And don’t forget to run, it’s great for the body and the mind (even if it’s hard), as I keep reminding myself! Rebecca, thank you for your encouragement 🙂 I’m finding that with every comic panel, I’m learning something new. I hope that doesn’t go away. I’m also looking forward to following your process with watercolours (a medium which I find intimidating). Happy to say I went running yesterday. I’m nowhere near knocking out the 8Ks back in the fall but start small, build gradually.